With its clean vertical lines the Forest Hills Portrait Fireplace adds a striking design element to your home decor. Available in Contemporary and Traditional models, these unique fireplaces offer several designer options to let you create your perfect fireplace. In the contemporary models, the vertical motif carries through to the interior where multiple folds in the porcelain liner add to the impression of height. 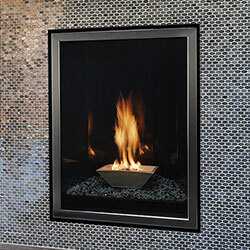 The rich black porcelain reflects the fire to create depth and enhance visual interest from any position in the room. The dual burner system resides in the earthenware Piazza vessel filled with your choice of crushed glass. Choose a black or white vessel and add one or more colors of crushed glass. For a more conventional fireplace, choose the traditional model with its realistic hand-painted log set and ceiling-mounted accent lighting. Add the Rustic Banded Brick or Old World Stone liner - or the Black Porcelain liner which reflects the flame to create even greater visual interest. The available andirons help convey an old-world look. All Forest Hills fireplaces include a multifunction thermostat remote control that can vary the flame height of the main burner. The remote lets you vary the accent lighting system or the optional blower, and even operate an unrelated appliance - such as a lamp or holiday decorations plugged into the outlet beneath the fireplace. Currently there are no vides available for this product.